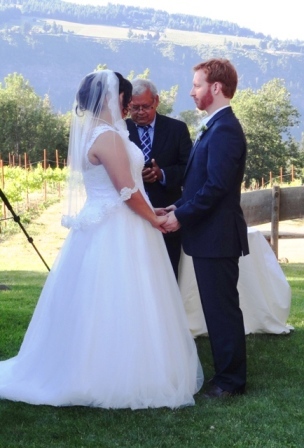 With Bekah finishing her medical degree in Eastern Washington and Huddy in Australia, we only meet Bekah once before their wedding day at Cathedral Ridge Winery to plan the details. All the important details of tables, menus, service styles, and schedules were worked out over the phone, in many e-mails, and using our detailed 13 page event plan. With guests coming from around the world, they knew that the food and party needed to be worthy of the travel. 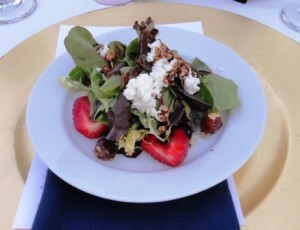 And selecting the right caterer was very important to a successful event at Cathedral Ridge Winery. With Voila Catering’s kitchen in Portland, it would have been a disaster to bring out hot food all the way out to Cathedral Ridge Winery. 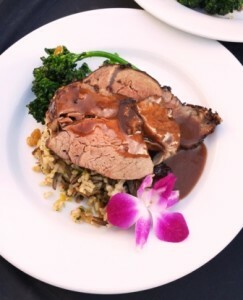 And just for that reason, at every event, our chef team brings out full size convection ovens and cooks everything right before serving for the ultimate in catered food quality. To simplify planning for Bekah and Huddy on their big day, Voila Catering planned and provided all the food, linens, glassware, flatware, china, and napkins for the dinner. 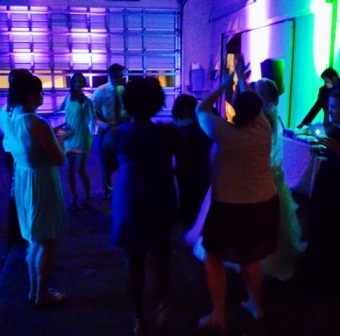 And for the dancing afterwards, the lighting and sound system to set the mood! After the ceremony overlooking Mt Adams at Cathedral Ridge Winery, our staff of uniformed servers passed small hors d’ oeuvres to the guests as they mingled and socialized. 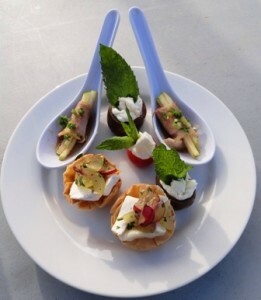 Designed for standing receptions, our delightful bites are easy for the guests to eat and never messy….. which is important when your guests are dressed in their finest! Guest were seated to a salad of baby greens, creamy chevre, candied Oregon hazelnuts and local, ripe strawberries… all with a drizzle of chef-made balsamic vinaigrette. 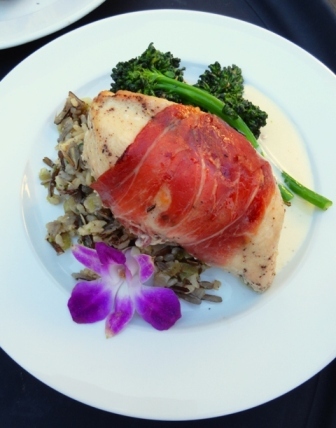 Chicken Braciole stuffed with mushrooms and fresh spinach then prosciutto wrapped! Guest had pre-ordered their dinner selection which was cooked by the chef team and plated right before serving. Because it is critical for us to serve the guests fresh, hot food, we always use the assembly line technique of building food with the food going straight to the guest, never sitting around on a cold plate waiting to be mass produced. It is this attention to detail that makes out food the ultimate in catered food quality at venues like Cathedral Ridge Winery. Made from Scratch! All our sauces including the Truffle Creme on the Chicken Braciole and the Cocoa Demi Glace for the Tenderloin are always chef-made from scratch. There are never any powdered, frozen, or canned sauces in the food from Voila Catering! At the end of the Cathedral Ridge Winery wedding reception, the Voila Catering staff team cleans up the tables & chairs, packs out the dirty glassware, gathers the centerpieces, and packs the truck allowing Bekah and Huddy to head off to their first night together as husband and wife!